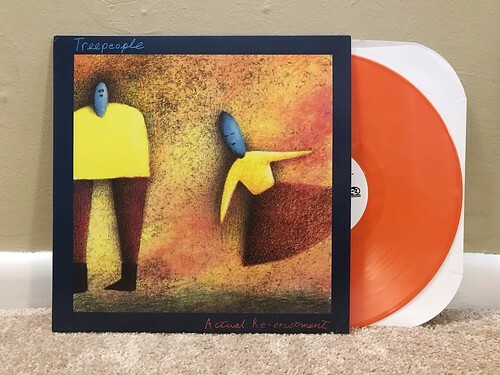 After the bang-up job Gravy Lane did on the Stuntman LP they rereleased a little while back, I was extremely excited to hear that they were going to put out this Treepeople album on vinyl. Actual Re-Enactment originally came out on C/Z records in 1994, but was only out on CD and cassette. This left a gigantic hole in the Treepeople vinyl discography and thankfully that omission has finally been rectified. Actual Re-Enactment is a post-Doug Martsch Treepeople album, but in my eyes it's just as dynamic and listenable as anything that came out while he was still a member. Actual Re-Enactment still has heaps of the dynamic guitar interplay that I always felt was the most distinguishing trait that the band brought to the table. It's a unique balancing act between noisy chaos and catchy riffs and this is a balance few bands ever pulled off as successfully as Treepeople. Just take a listen to "Slept Through Mind." It's my favorite song on the album, mostly for the way the band perfectly places sludgy guitar drone right smack in the middle of an otherwise chill pop song. On paper it shouldn't work as well as it does, but leave it to Treepeople to not only make it work, but make it a highlight of the album. The vinyl version Gravy Lane released has been remastered for vinyl and the album pops even more brightly than the CD I've been carrying around for the past few decades. I'm quite thankful to the label for helping me finally add this record to my collection.